MAPS OF THE ANCIENT SEA KINGS author Hapgood's classic book PATH OF THE POLE is back in print! Hapgood researched Antarctica, ancient maps and the geological record to conclude that the Earths crust has slipped in the inner core many times in the past, changing the position of the pole. 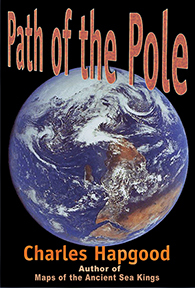 Path of the Pole discusses the various pole shifts in Earths past, giving evidence for each one, and moves on to possible future pole shifts. Packed with illustrations, this is the Sourcebook for many other books on cataclysms and pole shifts. Is another pole shift coming soon?